I already showed last year a unit of 5 gutter runners and Deathmaster Snikch. Altogether they make a unit of 6, which is a bit too short for fielding them in an effective way, so I am going to add another 2 or 3 to the unit. 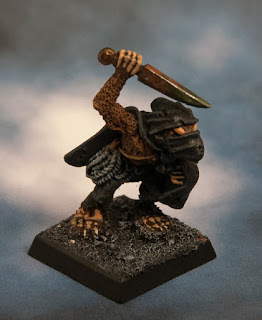 Since I have most of the skavens I need already, I am not actively looking to buy new ones, so only when I find them in some job lot that interests me or when I see them in a second hand shop I buy them, therefore I will be adding them slowly from now on. At the moment I am just adding a new one to boost up the unit to 6. This adds 12,5 points for 3rd ed. and 12 points for the 4th ed. version.